Reverse mortgage endorsements dipped 15.5% between May and June of this year, according to the most recent update from Reverse Market Insight — and the long-term arc of the post-October 2 recovery is following a well-worn pattern. Both Federal Housing Administration-approved lenders and their non-approved counterparts endorsed 2,833 loans in June, down from the 3,351 Home Equity Conversion Mortgages logged in May, which represented the only increase — albeit of just 0.1% — since January. Wholesale lenders suffered a bit more than the retail side, with drops of 19.1% and 13.2%, respectively. The Dana Point, Calif.-based RMI also took a deeper dive into the fallout from the October 2017 principal limit factor cuts, the primary driver behind the recent streak of falling endorsements. In an analysis published Thursday, RMI plotted the endorsement trends in the immediate wake of multiple industry-shaking events: the first PLF cut in 2009, the 2014 PLF restructuring, and the introduction of Financial Assessment in 2015. While the 2009 move prompted the largest-ever endorsement drop on a percentage basis — a 48% dip eight months after the change took effect — the most recent set of changes isn’t far behind. “What’s not comforting about this chart is that our most recent change is closer to that worst-case scenario than either of the two more recent changes, checking in at -35% in month 10, whereas the 2009/2010 PLF change had already recovered to -33% by that point,” RMI noted in its analysis. 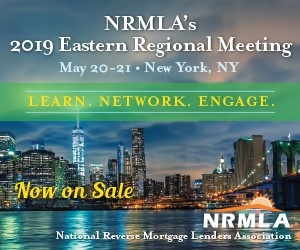 Part of the problem in comparing the effects of historical changes, according to RMI president John Lunde, is that any major policy shift prompts an immediate near-term surge as borrowers and lenders try to lock in loans under the “old” structure. For instance, the industry hit a post-Financial Assessment cycle peak of 5,749 endorsements in August 2015, which the industry surpassed in January 2018 with 6,313. Without context, that looks like an industry figuring out a way to adjust to the changes, but the January jump only came as a result of the October 2017 overhaul — which brought a flood of borrowers who wanted to maximize their proceeds under the the 2014-era PLFs. That analysis hints at the potential for private loans to fill some of the gaps, as multiple lenders have rushed to enter the space this summer. In the years leading up to the recession, proprietary loans accounted for about 10% of total dollar volume and around 5% of overall volume, Lunde said. “Given where the HECM is at today, I’d think the potential for private products would be higher than that, although I would expect it to take some time to get there,” he said. On the flip side of the recovery trend, the industry has not yet seen a return to the monthly endorsement peak in December 2009, when lenders recorded 8,284 endorsements a few months after HUD rolled out lower PLFs in October of that year. But Lunde did strike one note of optimism, pointing out that the industry has generally found ways to roll with the changes in the years following the significant decline of 2009.